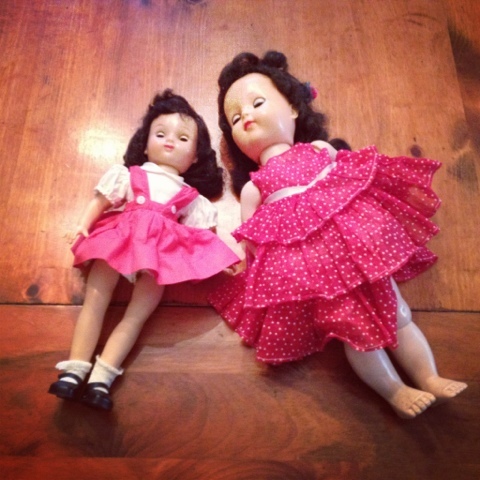 These are my mother's childhood dolls, Betsy McCall and Posie. Well, technically this is not my mother's childhood Betsy. That was the one she had to give away to the girl whose house burned down, only to find it forgotten and lying in the dirt later on. 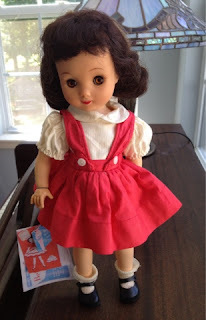 I recount the entire story in my Fads of the Fifties post. This Betsy is a replacement my mother bought for herself. She bought the doll knowing it needed re-stringing. As you can see, Betsy's head was very loose and she could not stand or sit alone. She bought the doll several years ago, though, and had never taken any action to get it fixed. Then recently I heard her say she didn't know where she'd put it. I was looking for some rollers in the upstairs closets at their home and came across both these dolls. 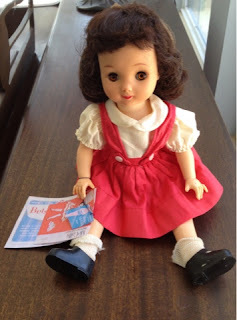 Betsy, who my mother purchased at great expense, was just thrown on a shelf along with Posie, not even boxed. 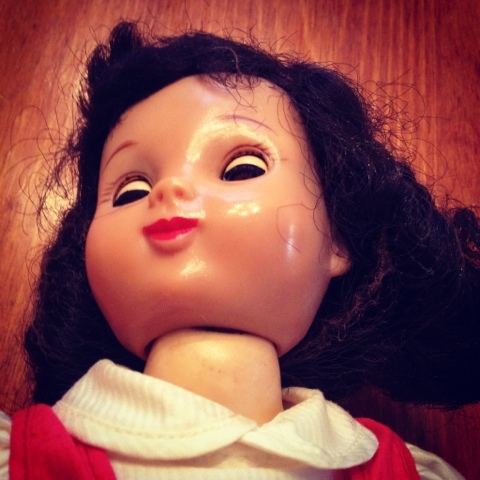 This goes farther to explain why my grandparents told her to give her doll away when she was a child. I bet that doll was also just tossed somewhere. Since my mother's birthday is coming up, I filed away the location of her dolls and about a month ago I snuck over there and smuggled them out. I thought having them restored would be a great (and inexpensive) birthday present. I could see right away that the Betsy was in worse shape than my mother had mentioned. I don't know if her condition was exacerbated by improper storage or if she came this way, but her face had the sticky finish that plagues so many soft plastic dolls of this era. Betsy was also quite dirty. Luckily, this Betsy is the Ideal 14 inch soft plastic head on a P-90 hard plastic Toni body, so her body just needed cleaning. Her hair is still in its original style and even has its hair net and pins intact, although the hair net is starting to deteriorate and tear apart. She also has her original complete outfit. 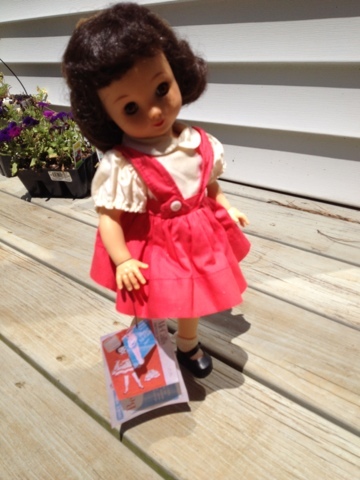 She is only missing the doll curlers that would have come clipped to her tag. 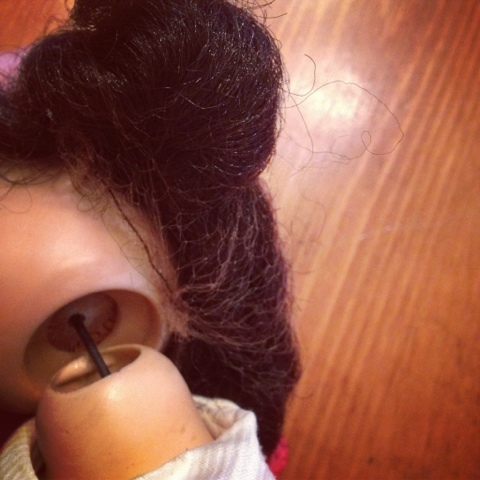 I started the restoration by cutting the old rubber band and taking the doll all apart for cleaning. I got her cleaned inside and out...and someone asked to see our house and I had to pack everything up again until now! Now that we are moving, I should be packing the POD while the baby naps but instead I am procrastinating by working on my blog! I did load very heavy boxes, carrying them up and down stairs, for two hours yesterday, though! So, a few days ago I got Betsy back out and restrung her using elastic cord. Now she sits and stands alone, although she was hard to re-string. She was originally strung on one band, but that makes it so that if you string her tight enough for the head and legs to be firm, the arms are so tight that when you lift them they snap back in place. So I wonder if she wouldn't do better with her arms strung separately, but since I am out of cord this will have to do. To clean her hair in the fragile net, I just dabbed it very gently with a damp paper towel and brushed the bangs when it dried. I don't want to mess with the hair net and pins, though at some point the wig will need to be re-glued. I can see some bits of thread and fraying of the muslin wig cap, meaning it is starting to go. Once Betsy was all clean I treated the shiny, sticky face. This is fairly easy. You just put some baby powder into your hand and massage it gently all over the sticky plastic. It rubs in and disappears. Sometimes you have to rinse the ears or nostrils out with a damp Q-Tip to remove excess. You can also rub a dry tissue over any excess to brush it away. Try to avoid the eyes, but if you do get some in the eyes you can clean them with a Q-Tip as well. You will have to repeat this periodically. The stickiness comes from the plastic actually beginning to break down, and unless you are able to store the doll in a hermetically-sealed vault it is going to continue. The doll with a powder-treated face. As a final touch I printed out some photos I found online of the doll in its original box and cut out the tags and box label to make new tags for this doll. The print quality isn't fantastic, but now you get an idea of what she looked like new. I hope it takes my mom right back to 1957! Now I have to tackle Posie, who is in much worse condition. 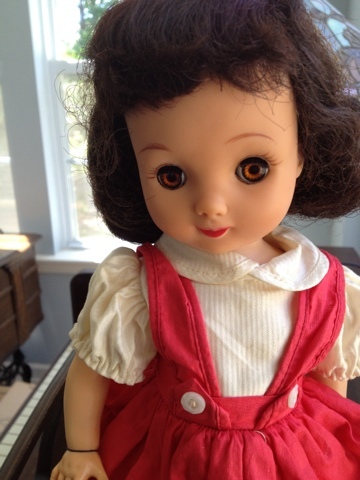 She has a pretty bad hip split, also a sticky face as well as a spotted face (I think she has what some people call "Chatty Measles"), and she is in desperate need of a partial face repaint and hairdo. We moved our closing date forward at the request of our buyers, so we will move into my parent's house in one week. So if I want these to be a surprise I need to get them done now! Unfortunately, Jerry wrecked his car yesterday (thankfully no one was hurt) so now we are down to one car with so little time left before we move. When it rains it pours! Betsy McCall all finished with her repro tags. Betsy's new stringing lets her stand and sit alone.